Immigration from England, Curaçao, and Germany. Largest island in the British West Indies. It has a total population of 644,841 (1901), of whom about 2,400 are Jews. When England conquered the island in 1655, a considerable number of Jewish inhabitants was found there, known as "Portugals," under which name the Sephardic Jews concealed their true faith from Spanish persecution. Jews settled in Jamaica during the century preceding Cromwell's conquest. The proprietary rights of the family of Columbus to Jamaica were recognized in 1508 and 1538, and passed to the female Braganza line in 1576. The friendship which subsisted between Columbus and the Jews continued with his descendants, and as their proprietary rights excluded the Inquisition and prevented the inclusion of Jamaica in the bishopric of Cuba, unavowed Jews were enabled to live in Jamaica in comparative safety, even during the Spanish period. Clarendon's "State Papers" refer, under date of 1623, to some of these Portuguese as yearning to throw off the Spanish yoke. The principal pilot, Captain Campoe Sabbatha, whom Penn and Venables relied upon in their attack upon Jamaica seems to have been a Jew, and there is strong reason for believing that Cromwell considered Jews settled and to be settled in and about Jamaica as important factors in the establishment of his ambitious British colonial policy. Simon de Caceres, one of Cromwell's principal secret-intelligencers, furnished him with reports on conditions in Jamaica immediately after its conquest. The British, in their methods of dealing with the conquered residents, were careful to distinguish between the Portuguese Jews and the Spanish inhabitants, with the result that Jews at once began to establish and develop the commercial prosperity of the island. The Dutch capitulation of Brazil augmented the Jewish settlement in Jamaica; it was further increased by considerable accessions from Surinam upon the British withdrawal from that district in 1675, and by direct migration from England, beginning in 1663, and later from Curaçao and Germany. In 1700 the Jews bore the bulk of the taxes of the island, though the avowed Jewish population at that time is figured as only 80. No fewer than 151 of the 189 Jews in the American colonies whose names have been handed down as naturalized under the Act of Parliament of 1740 between that year and 1755, resided in Jamaica. The vanilla and sugar industries of Jamaica, and in fact almost the entire foreign and intercolonial trade of the colony during the first half of the eighteenth century, were principally in the hands of the Jews, and Jamaica was a far more important commercial center in that century than it since has been. Among the leading Jewish families that contributed most signally to the development of Jamaica's trade are the following: Da Silva, Soarez, Cardoza, Belisario, Belinfante, Nuñez, Fonseca, Gutterecet, De Cordova, Bernal, Gomez, Vaz, and Bravo. Efforts were early made to abolish the special taxes which were imposed on Jews in the colony, which efforts, with the assistance of the crown, finally succeeded. Attempts, inspired by local mercantile jealousy, made during the reign of William III. to expel the Jews from the island, also met with a vigorous royal check. 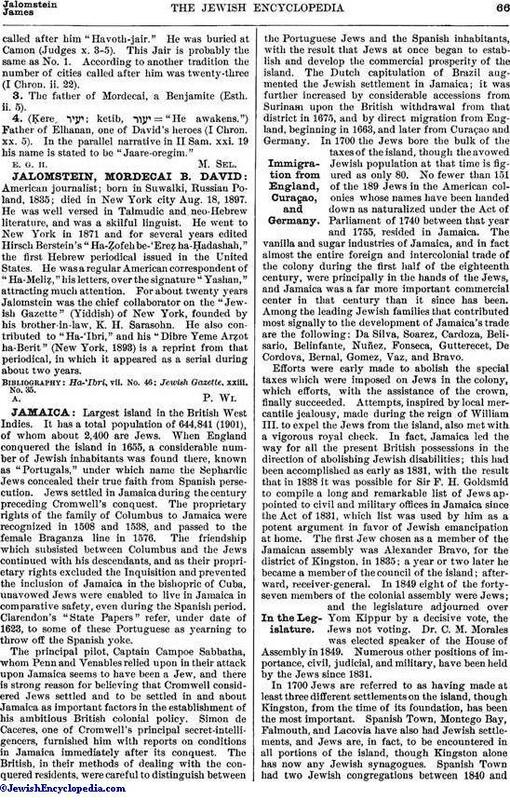 In fact, Jamaica led the way for all the present British possessions in the direction of abolishing Jewish disabilities; this had been accomplished as early as 1831, with the result that in 1838 it was possible for Sir F. H. Goldsmid to compile a long and remarkable list of Jews appointed to civil and military offices in Jamaica since the Act of 1831, which list was used by him as a potent argument in favor of Jewish emancipation at home. The first Jew chosen as a member of the Jamaican assembly was Alexander Bravo, for the district of Kingston, in 1835; a year or two later he became a member of the council of the island; afterward, receiver-general. In 1849 eight of the forty-seven members of the colonial assembly were Jews; and the legislature adjourned over Yom Kippur by a decisive vote, the Jews not voting. Dr. C. M. Morales was elected speaker of the House of Assembly in 1849. Numerous other positions of importance, civil, judicial, and military, have been held by the Jews since 1831. In 1700 Jews are referred to as having made at least three different settlements on the island, though Kingston, from the time of its foundation, has been the most important. 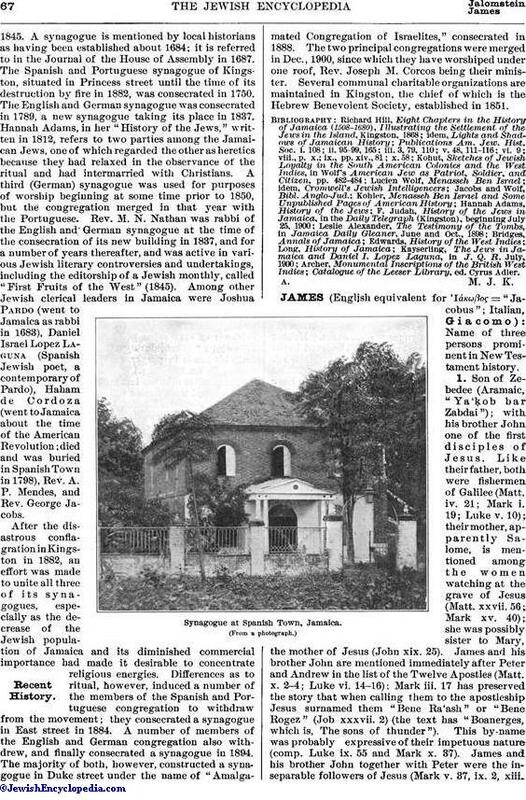 Spanish Town, Montego Bay, Falmouth, and Lacovia have also had Jewish settlements, and Jews are, in fact, to be encountered in all portions of the island, though Kingston alone has now any Jewish synagogues. Spanish Town had two Jewish congregations between 1840 and1845. A synagogue is mentioned by local historians as having been established about 1684; it is referred to in the Journal of the House of Assembly in 1687. The Spanish and Portuguese synagogue of Kingston, situated in Princess street until the time of its destruction by fire in 1882, was consecrated in 1750. The English and German synagogue was consecrated in 1789, a new synagogue taking its place in 1837. Hannah Adams, in her "History of the Jews," written in 1812, refers to two parties among the Jamaican Jews, one of which regarded the other as heretics because they had relaxed in the observance of the ritual and had intermarried with Christians. A third (German) synagogue was used for purposes of worship beginning at some time prior to 1850, but the congregation merged in that year with the Portuguese. Rev. M. N. Nathan was rabbi of the English and German synagogue at the time of the consecration of its new building in 1837, and for a number of years thereafter, and was active in various Jewish literary controversies and undertakings, including the editorship of a Jewish monthly, called "First Fruits of the West" (1845). Among other Jewish clerical leaders in Jamaica were Joshua Pardo (went to Jamaica as rabbi in 1683), Daniel Israel Lopez Laguna (Spanish Jewish poet, a contemporary of Pardo), Haham de Cordoza (went to Jamaica about the time of the American Revolution; died and was buried in Spanish Town in 1798), Rev. A. P. Mendes, and Rev. George Jacobs. After the disastrous conflagration in Kingston in 1882, an effort was made to unite all three of its synagogues, especially as the decrease of the Jewish population of Jamaica and its diminished commercial importance had made it desirable to concentrate religious energies. Differences as to ritual, however, induced a number of the members of the Spanish and Portuguese congregation to withdraw from the movement; they consecrated a synagogue in East street in 1884. A number of members of the English and German congregation also withdrew, and finally consecrated a synagogue in 1894. The majority of both, however, constructed a synagogue in Duke street under the name of "Amalgamated Congregation of Israelites," consecrated in 1888. The two principal congregations were merged in Dec., 1900, since which they have worshiped under one roof, Rev. Joseph M. Corcos being their minister. Several communal charitable organizations are maintained in Kingston, the chief of which is the Hebrew Benevolent Society, established in 1851. Catalogue of the Leeser Library, ed. Cyrus Adler.